Timbre bleu (Blue Stamp). 1957-59. 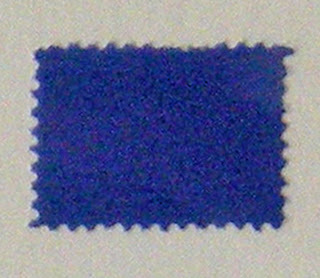 IKB pigment on postage stamp. 0.98 in. x 0.79 in. 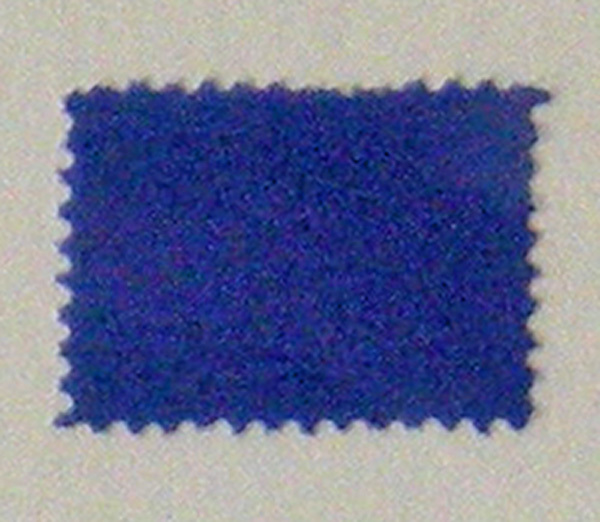 Klein originally created blue stamps to be sent through the mail (in the place of official postage stamps) to announce a double exhibition at Iris Clert and Colette Alendy in 1957. This is one of the unsent examples, thus retaining all of the “purity” of its IKB brilliance! This proposal, however modest in size, is a signal production in the history of both neo-avant-garde exhibition-making and of artist’s publicity. “In many ways, (Yves Klein’s) stamps conformed with the usual ones: they were small, regulation-sized rectangles with perforated edges,” writes Sidra Stitch. “Unlike official stamps, however, they were totally blue, imageless, and devoid of any signifying information. They were thus a telling reversal of the commemorative stamp that features a depiction of someone or something, as well as a contrast to the pragmatic prerequisites of philatelic design practiced by modern governments...in the most modern sense, they were also logos, instantaneous signs, advertisements, components of a spectacle.” Fine and with excellent provenance.